Notre Dame Law School’s Hispanic Law Student Association recently announced JoAnn Chávez, ’86 B.A., ’90 J.D., as this year’s recipient of the Graciela Olivarez Award. HLSA presented Chávez with the award March 18, at a dinner at the Main Building. For 20 years the Graciela Olivarez Award has been presented to Hispanic lawyers and judges whose work embodies the spirit of Graciela Olivarez, the first woman and first Hispanic to graduate from Notre Dame Law School. Olivarez was a lawyer who spent her career advocating for civil rights and for the poor. She served as the chair of the Mexican American Legal Defense and Education Fund, and was one of the first two women on its board. In 1977, President Jimmy Carter appointed her the director of the Community Services Administration. She thus became the highest-ranking Hispanic woman in the Carter administration. Chávez currently serves as Vice President and Chief Tax Officer for DTE Energy (NYSE: DTE), a Detroit based diversified energy company involved in the development and management of energy related businesses and services nationwide. She has more than 25 years of experience in the areas of tax accounting, controversy, risk management, mergers and acquisition, tax planning strategies, and is currently responsible for overseeing all of DTE Energy’s tax strategy, policy and compliance, including federal, state and local income, sales, use, and property taxes. Previously, Chávez served as an international tax partner for KPMG LLP with experience serving large multinational clients in their Tampa, Chicago, Mexico City, and Detroit business units. Chávez has often been recognized for her achievements in advancing the culture of Latino American businesses, and is a frequent speaker in the Hispanic community. 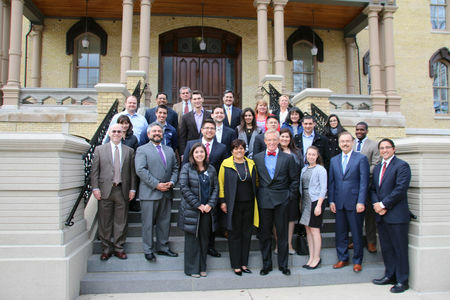 To create a pipeline of Hispanic legal leaders she recently established the Chávez Family Law Fellowship at the Law School. Previous recipients include U.S. Supreme Court Justice Sonia Sotomayor, Assistant Secretary of Education for the Office of Civil Rights, Norma V. Cantu, and MALDEF President Thomas Saenz. Originally published by Lauren Love at law.nd.edu on March 22, 2016.